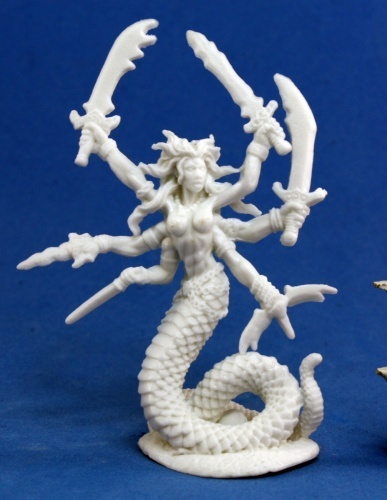 Despite the fact that there are literally hundreds of small minis that came with this particular kickstarter, project there are a couple of minis that stand out. One of them is this week’s model. 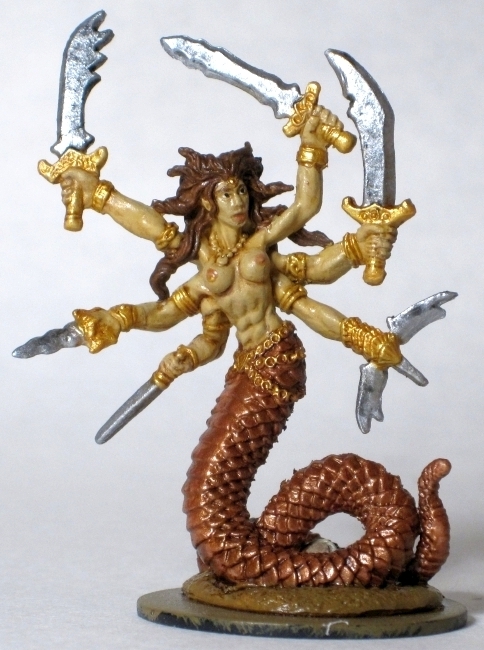 All of the snake models are particularly detailed, but scales aside, this model still qualifies as intricate. Everywhere you look are little details of jewelry and quirks of design. If you really scrutinize the picture to the left you will see the skull just peaking out from beneath her tail for instance. If you peak below the fold though, you will see entirely different details. Alas, I saw no projects to call out this week, so let’s go straight to the minis. Though I made good progress this week, life proved too hectic for me to complete this particular paint job on time. I want to do a better job on the highlights, the hilts, and some color variation in the scales before I call it good. I chose the same color scheme as an earlier snake mini (pictured in the background) to what I think at least, is a good effect. Magnus went with an altogether cleaner color scheme that would best be described as gilded. I think he did an especially good job on the eyes this week. 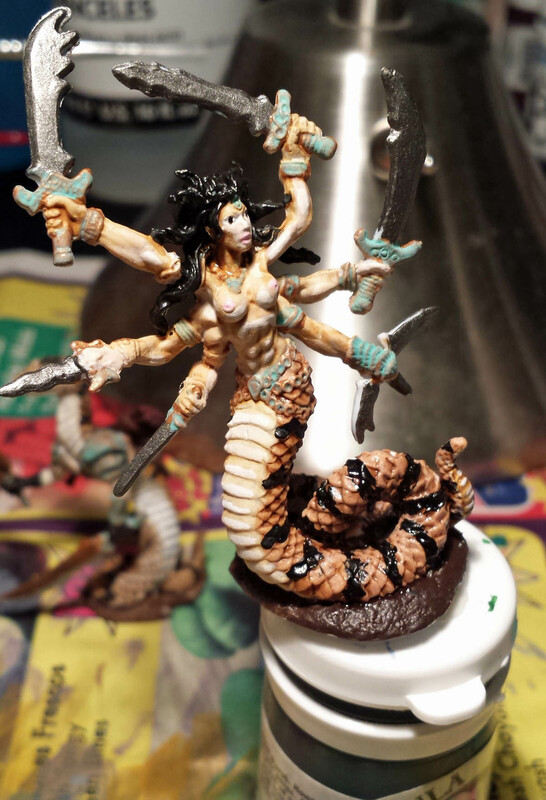 Arjen says they are not finished, but so far this mini looks outstanding. It is definitely calling back to the demon roots of this model. Great work Arjen! Last we have Antonia’s mini. Per her stated goal, I think she has done an outstanding job of nailing Kali. The skulls and the tropical base are a nice tough, but even without that, the color scheme would have called up the image to me. The foliage looks great Antonia, but wherever did you get such detailed little skulls to make her necklace with? Hell Hound – Send pictures to caffeineforge@gmail.com by 5/11/14 at 9pm. Terrain – We’ve been showing off lots of miniatures these last few months, but you need some terrain too play with them. Show us all what you’re working on. Ape-X – one of the last big models left in the Vampire package. Nice work, all! A lot of variety this week. Antonia – your painting just blows me away! I really think the skulls were a nice touch. Hey all, great minis everyone! 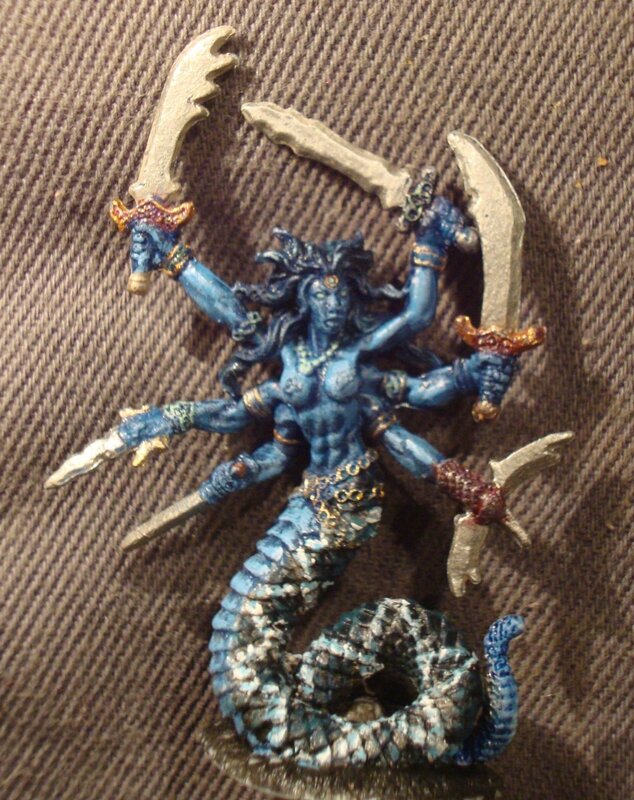 I especially liked Arjen’s colour scheme – since the mini itself reminded my so strongly of Kali, I like the “Living statue” look your blue colors invoke! @David: Sorry for the late answer – I used skulls by a company named “Tabletop Art” which sells resin cast bits & pieces. For the neclace I carved down one of those until it fit, since although the skulls are quite delicate and small, they still look quite large worn around the neck. 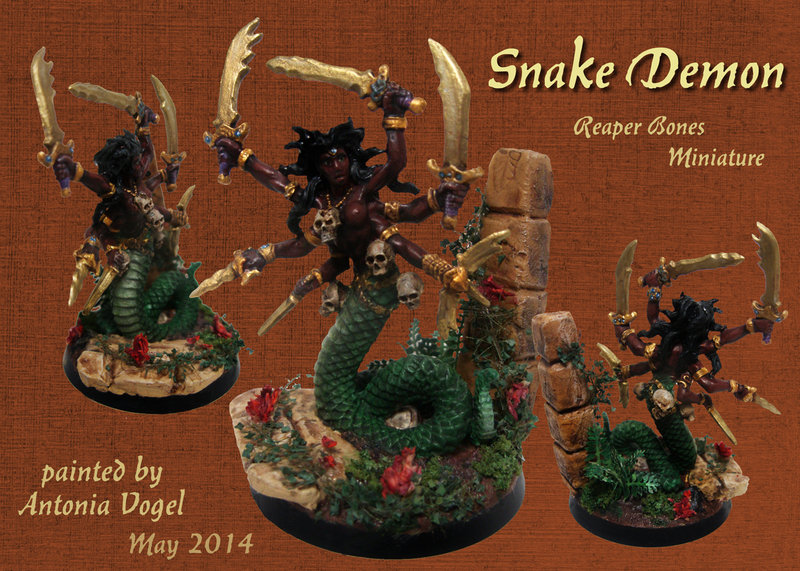 @antonia damien and harpy are core (and on my list of proposed minis as well!) others are add-ons. Tiik champion i bought later, so i would not mind that one, but i dont know if others have it. Overladen henchman/trader was already a monday miniature. I don’t believe it has, on account of mine still being unpainted. In general I’m trying to stick to the vampire set, because I know everyone has them.